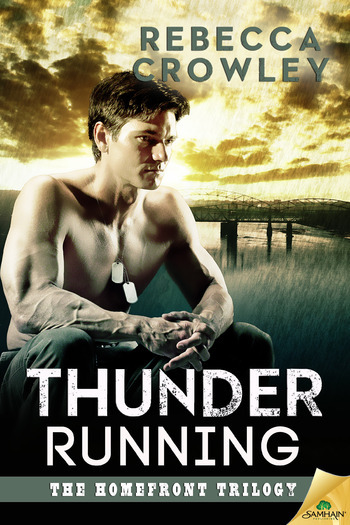 release day for Thunder Running! Faithful readers, I owe y’all a blog post on the rather significant event that happened four weeks ago – the birth of our daughter, baby B! Life with a newborn has been as hectic as everyone warned us it would be, so while the full report of B’s birth is TK, I had to pop in and celebrate the release of the third and final installment of The Homefront Trilogy, THUNDER RUNNING! I really love this novella. Like, really love it. I know authors picking their favorite characters is like parents picking their favorite kids, but the truth is I have a special, deep affection for Thunder Running‘s hero and heroine, Chance McKinley and Tara Lambert. I love Chance’s dry-humored recklessness, I love Tara’s tough-talking complexity, and I love the way they navigate the rough waters between their mile-high defenses to come together and form a whole. Thunder Running‘s release is bittersweet for me, as at the same time I’m introducing the world to Chance and Tara, I’m also saying goodbye to the guys in Echo Company and stepping off the paths they’re following, leaving them to carry on in readers’ imaginations. I hope you’ve enjoyed their journeys as much as I have, and that Thunder Running offers a fitting end to what I hope is a compelling, satisfying trio of novellas. If you haven’t gotten your digital copy yet, Thunder Running is available via the links below and wherever else fine eBooks are sold. Happy reading! This entry was posted in Uncategorized by Rebecca Crowley. Bookmark the permalink.